Original Content: And What Is This Supposed To Be? And What Is This Supposed To Be? 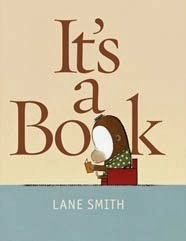 I received It's a Book by Lane Smith for my birthday. I recall it getting a lot of attention when it was published in 2010, and I can remember something else, too, though I'm having some trouble putting my finger on it. Was there just a little bit of controversy over this thing? Maybe because of the text on the last page? Because some considered it too adult? I think the whole book is kind of adult. It's all about a monkey trying to get through to a jackass that a book is a book, not an electronic device. The whole issue of children being too plugged in too early seems to be a very adult concern to me, not one that children are even aware of. You could make the argument that that is the point, to make children see this before they become too enamored of electronics. But if kids haven't yet become enamored of electronics will they understand terms like "text," "tweet," and "Wi-Fi?" There's an overt message in It's a Book, I think, one that adult readers concerned about keeping reading a traditional book-centered activity will embrace. That's okay. I'm a big fan of picture books for adults. In fact, it could be a fun read-aloud for them with their little ones. I don't know how many young picturebook readers will get this on their own, though. How Long Can You Work On Something? "Don't Hold On To Desire" And "Always Say Yes"
Can This Picture Book Be Saved?